The Native American story of Standing Bear. Learn about the culture, stories, myths and legends of American Indians and their famous chiefs and tribes. A Native American Story of Standing Bear to teach kids about Native Indians in a short, enjoyable, easy to read format. 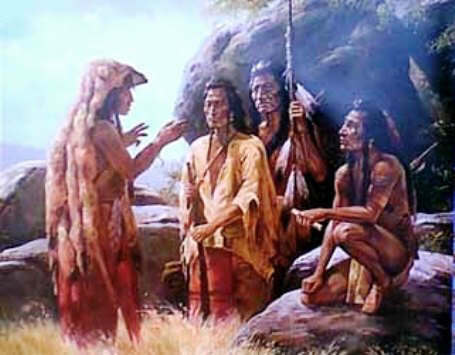 The Ponca Indians were members of the large Siouan family. They had not always been a separate tribe. In the old days they and the Omahas and the Kansas and the Osages had lived together as Omahas, near the mouth of the Osage River in eastern Nebraska. Soon they divided, and held their clan names of Poncas, Omahas, Kansas and Osages. The Poncas and Omahas clung as allies. Finally the Poncas remained by themselves, low down on the Niobrara River in northern Nebraska. When the captains, Lewis and Clark, met some of them, the tribe had been cut by the small-pox to only some two hundred people. They never have been a big people. Their number today, about eight hundred and fifty, is as large as ever in their history. They and the Omahas warred with the Sioux, but they never warred with the white men. They have always been friendly to the white men, except once; and that once brings up the story of Standing Bear. Back in 1817 the Poncas made a treaty of friendship with the United States; and in 1825 they made another treaty, allowing white traders to live among them, and agreeing to let their own bad men (if any) be punished by the United States; and in 1859 they made another treaty, selling their hunting grounds to the United States, and keeping a tract on the Niobrara River for their own homes. None of these treaties did they break. They were at peace with even the Sioux. They had good farms, and were prospering. But in 1868 the United States laid out a new reservation for the Sioux. By a mistake this took in the Ponca reservation in Nebraska, and the Poncas were not told. The way they found out, was this: The Sioux began to come in and claim the land. "That is not right," said the Poncas. "You do not belong here. All this country is ours. Go back. We do not want you." So there was fighting, every little while, and the Poncas lost many warriors. This continued for nine years, until, by the raids of the Sioux, one fourth of the Poncas had been killed or captured. Still they had not been told by the United States that these lands were theirs no longer; but, suddenly, in 1877, they were told that they must get out. At this time they had three villages, on the lower Niobrara River, and eight bands, each under a chief. The chiefs were Standing Bear, White Eagle, Big Soldier, Traveling Buffalo, Black Crow, Over-the-land, Woodpecker, and Big-Hoofed Buffalo. The United States informed the eight chiefs that they must remove their people to the Indian Territory, but did not say why. Standing Bear had been born in 1829, so he was forty-eight years old. He stood high among the Poncas, because of his clan, the Wa-zha-zhe—a clan that could cure rattle-snake bites and work other wonders. He strongly opposed giving up the Ponca home-land, upon which the tribe had lived for almost one hundred years, and which the United States had agreed, on paper, to give them in exchange for their hunting grounds. The other chiefs thought the same. They could not understand why they all should be thrown off, when they had done nothing wrong. "The President says that you must sell this land. He will buy it and pay you money, and give you new land in the Indian Territory." "We do not know your authority," argued Standing Bear. "You have no right to move us until we have held a council with the President." "If you like the new land, then you can see the President and tell him so," offered the inspector. "If you don't like it, then you can see him and tell him so." So Standing Bear and nine other chiefs went; but they were dubious. The inspector showed the three pieces of land, and told them to choose. All the pieces were bad pieces. It was a hot country and a bare country, and not suited to the Poncas, who had good corn-fields and houses in their own country of the Niobrara. "If you do not accept what land is offered you here, I will leave you here alone. You are one thousand miles from home. You have no money. You cannot speak the language." "But we do not like this land," explained Standing Bear. "We could not make a living. The water is bad. Now send us to the President, as you promised." The man would not send them. He would not take them home. He would not give them any of the Indian money, for buying food. He would not give them a paper, to show to the people along the way. He would not give them the interpreter, to talk for them. He would not take them to a railroad. "He left us right here," said Standing Bear. "It was winter. We started for home on foot. At night we slept in hay-stacks. We barely lived till morning, it was so cold. We had nothing but our blankets. We took the ears of corn that had dried in the fields; we ate it raw. The soles of our moccasins wore out. We were barefoot in the snow. We were nearly dead when we reached the Oto reservation. It had been fifty days." Their feet made bloody marks on the Oto reservation. The Otos and the Oto agent treated them kindly. They stayed ten days, to rest; then the Otos gave them each a pony, and in two more weeks they were home. It had been a cold, hungry journey, of five hundred miles, and their relatives and friends were glad to see them again. But the United States inspector was waiting for them. He was angry. He said that the Great Father had ordered the Poncas to change homes. It did not seem to matter whether or not they liked the new home. And he called for soldiers, and all the Poncas were bundled out of their villages and taken to the hot country of the south. On the way women and children died. Standing Bear's daughter died. Just as Standing Bear and the other chiefs had tried to explain, the new country was not a good country for the Poncas. It was humid and hot; their Niobrara country had been dry and bracing. Within one year a third of them were dead from sickness; the rest were weak and miserable. They pined for the villages that they had built and loved, and that they had lost without any known reason. After a year and a half Standing Bear's boy died, as so many others had died; and the heart of Standing Bear was heavy. He did not sleep, by thinking that his son's bones must lie here in this unfriendly country. His medicine demanded that the boy should rest with their ancestors, in the Ponca ground along the dear Niobrara. Therefore, in January, 1879, he placed the bones in a sack, and tied the sack to his neck, and taking his people who could travel, he set out to walk to Ponca land. That was hard work. 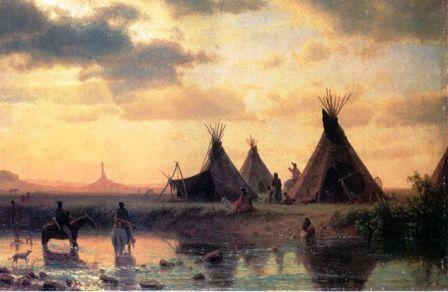 They made their way as best they could, but had been over three months on it when, in May, they arrived at the reservation of their friends the Omahas, near the Missouri River in northeastern Nebraska. Chief Standing Bear asked the Omahas if they might rest, and plant a few acres of ground, so as to get food. The Omahas gave them seed and ground. Standing Bear still had the bones of his son, in the bag. When he had started a crop, he was going on with the bones, and bury them at the Niobrara, where the Poncas of happier years had been buried. Before the crop was in, soldiers appeared, and arrested him and all his party, to take them back to the hot country. This much alarmed the Omahas. They had heard how the Poncas had been moved off without warning and without reason. Standing Bear was not being allowed to stay; he had lost hg country forever. The same thing might happen to the Omahas. They had a similar treaty with the United States. They thought that they owned their lands. They had been improving them and living off them for years. They had spent much money of the tribe, for tools and buildings, and were becoming like white men. The Government had issued papers to them, showing which land each man possessed. Now they were liable to lose their lands, as the Poncas had lost. The Omahas hastened to ask white lawyers about it. They were told that the papers did not show that they owned the land; the papers only showed which lands each man had a right to farm. The Omahas were Indians, and not white citizens, and could not own lands, man by man. When a man died, his land might be given to somebody else. Now dread fastened upon the Omaha tribe. They hastened to draw up a petition to Congress, asking that the lands which their men owned or thought they owned be put down on paper forever. They wanted titles such as the white men had, so the lands could be recorded. Miss Alice Fletcher, from Washington, had been sent to study the Omaha people; and they appealed to her. She helped them. The petition went to Washington, but the months passed without an answer. Meanwhile Standing Bear and his bag of bones and his party were being taken south, by the soldiers from Fort Crook, Omaha, to the sickly hot country. When they camped on their way, near Omaha, a newspaper man talked with them. His name was Mr. T. H. Tibbles. The story was printed in the Omaha papers, and at once Standing Bear had many white allies. The Omaha City people invited him to come in and talk to them; and so he did, in a church that was crowded with listeners. Two lawyers, Mr. Poppleton and Mr. Webster, adopted him as a client; and before the soldiers had started on with him, the lawyers asked the court for a writ of habeas corpus—a challenge to the United States to surrender him, as a person who had been unlawfully arrested. The United States argued that Standing Bear was an Indian, and that an Indian was not a "person," under the laws of the United States; he did not have any rights, in court. Standing Bear had left his tribe, and was nobody, until he returned; and even then, he would be only an Indian. Standing Bear's lawyers brought witnesses into court, to state that the Standing Bear party had traveled peacefully, like good citizens; had not even begged along the way. Standing Bear was told to arise and repeat his story. Part of it is contained in this chapter. It was a remarkable speech. The people in the court-room believed it. Standing Bear's heart warmed. He was no Indian; he was a man. The judge decided. He said that an Indian was a person, and had a right to the courts, and to liberty when he had not done wrong. The Poncas had been unjustly removed by force from their lands, and Standing Bear's party had been unjustly arrested. Therefore they should be released. When this word was carried to Standing Bear by his lawyers, he was so pleased that he almost wept. "Before this," he said, "when we have been wronged we went to war to get back our rights and avenge our wrongs. We took the tomahawk. We had no law to punish those who did us wrong, and we went out to kill. If they had guns and could kill us first, it was the fate of war. But you have found us a better way. You have gone into court for us, and I find that our wrongs can be righted there. Now I have no more use for the tomahawk. I want to lay it down forever." So he put it on the floor. "I lay it down. I have found a better way. I can now seek the ways of peace." He gave the tomahawk to Attorney Webster, "to keep in remembrance of the great victory." And a great victory it was, not only for the Poncas, but for all the Indians. Standing Bear's trip with the bones had gained him many new friends. Now he traveled straight to the Niobrara, and nobody dared to stop him. The next winter he made a tour of the East, with interpreters, and with Mr. Tibbles the newspaper ally. He spoke from many platforms, telling of the wrongs of the Indians. The newspapers everywhere spread his talk wider. Soon letters from white people and their societies began to pour into Washington, for the President and for the Congressmen. As a result, in the spring of 1880 the Senate of the United States sent a commission into the West, to find out if Standing Bear's stories were really true. They were true. Therefore the Poncas were told that they might go back to the Niobrara, if they wished. Some did so. They were called the Cold Country Band. Those who were willing to stay in the Indian Territory were granted better lands, and they were paid for the lands that they had lost in the north. They were called the Hot Country Band. Each band was given titles to the lands held by it. The Omahas, too, won out, and were given titles. They and the Poncas secured the rights of citizens of the United States. As for Standing Bear, he died, well satisfied and much honored, in 1908, aged seventy-nine, and was buried there near the Niobrara, in ancient Ponca country, where his ancestors slept. He had saved his tribe. The Native American Indian Story of Standing Bear provides an opportunity to read about the life and times of Native American Indians and many of their great chiefs and famous leaders. A Classic Short story about Standing Bear for kids and children of all ages. This short story of Standing Bear is great to read to kids and children at bedtime. This very short story contains folklore about the famous people of Native Indian tribes. This short Native American story has been selected to keep the attention of kids and children of all ages. Many of the traditional stories featured in this section are true and others are folk stories or myths and legends. Read our free short story online about Standing Bear. Read a free, online short story about the people of famous tribes Native American Indians to increase knowledge and understanding of the indigenous people of North America. The Story of Standing Bear. Discover the vast selection of pictures which relate to the Stories, History and Culture of Native Americans. The pictures show the clothing, War Paint, weapons and decorations of various Native Indian tribes that can be used as a really useful educational history resource for kids and children of all ages. We have included pictures and videos to accompany the main topic of this section - The Native American story of Standing Bear. The videos on this website enable fast access to the images, paintings and pictures together with information and many historical facts. All of the articles and pages can be accessed via the Native Indian Tribes Index - a great educational resource for kids.